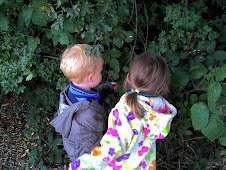 Yesterday we spent a fabulous day at Heartwood Forest. The forest doesn't actually exist yet but planting of the 350,000 hectares of land bought by the Woodland Trust begins this autumn and the forest, when completed, will be England's largest new native wood. The Woodland Trust are recruiting volunteers to help plant the 600,000 trees which I am very much looking forward to becoming involved in. Imagine in 50 years time being able to tell my grandchildren that I had a direct part in creating England's largest native woodland. This weekend however, was about raising awareness for the project and inspiring people to become a part of it. The Woodland Trust had put together a brilliant range of activities aimed at children, from willow crafts, to tree plaques, butterfly masks to baskets. We were able to watch a wood turner at work and sculptures and artwork being created from willow, grass and wood. Garden Girl decorated a beautiful butterfly mask while Garden Boy created a colourful picture with marker pens and glitter. Garden Mum and Friend showed Garden Girl how to plait willow, curling it up at the end to make a snail that will find a home in our garden and Garden Girl carefully placed berries, stones and leaves on a tree plaque to make an image of Garden Dad. Both our Little Garden Helpers contributed to the large picture of a flower field by colouring in and drawing butterflies, bees and flowers of their own. Garden Girl left her wishes to the forest, written on paper leaves, that 'the forest will become home to lots of elves' and that ' the shiny stars will shine down bright on the forest'. We did as much craft in one day as we usually complete in one week, enjoyed the fresh air and nibbled on blackberries which we picked on the walk back to the car. A wonderful day out and a wonderful project. What a great project to be involved in. England's wildlife thanks you!